TOP Lotto with over $500K Commission Ideal for a couple. Hard to find top performing Kiosk. Situated in a prime location of a neighbourhood centre with key anchor tenants such as Coles, Aldi and Woolworths Supermarkets. This is a proven business in a top location with high visibility, excellent foot traffic and plenty of customer parking. This is a fantastic opportunity for a complete lifestyle change with a strong local community and a very well promoted tourism industry - what a wonderful place to live. The business itself has shown good growth when compared to previous years - this year will be another record based on YTD verses prior performances. The business is diverse and the current owners are willing to do a substantial period of training with on-going assistance for any purchaser. This thriving agency is now available for sale in this outer developing area. Only 2 owners in 12 years. Tatts commission in excess of $340K per annum, Rent $34K per annum, good lease and otherwise minimal overheads only, if owner operated. Ideal for couple, other lines can be added , however this agency is predominately a straight Tatts Agency business. 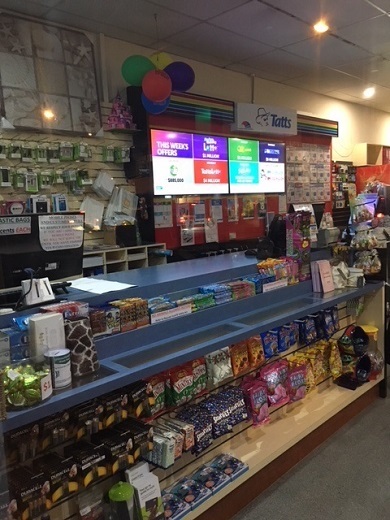 "Excellent Opportunity" for a couple or large family in this top performing Post Office and Tattslotto business situated in busy shopping strip that is well patronised by the local community. The Tatts shop fit and Post counter are both up to date with 2 terminal Lotto and 2 terminal Post. Commissions are in excess of $300K per year. This is a big business in a big shop. Huge profits for a couple or suitable for a large family or partnership. A big chance here for a new buyer to take advantage of the obvious further potential in this area for this Agency. Established less than 18 months the Tatts Commissions have had excellent quarterly increases, and the Adjusted Net Profit for the June 2018 year is in excess of $150 K already, and the following quarter is increasing significantly. Excellent rental $42K per annum, secure tenancy in a top position in the new Centre. Ideal for first Agency buyers. This agency is a perfect investment and new career change to join the thriving Tatts Network. This is a top Agency with strong Tatts with 3 Tatts Terminals and high tobacco and cigarette sales. Situated in a central position in a busy shopping centre. Good rent and lease terms. Ideal for couple with minimal part-time help required. Huge sales- Trading income is over $511K per annum with an Adjusted Net Profit for owner couple in excess of $350K per annum. Long lease and rental less than $35K per annum. A very busy position and a well established business. Excellent well trained and reliable long term staff operate this Agency since it is under semi – management. The first genuine buyer to see this agency will be keen to buy Premier believes.